Our Beautiful Blessings! 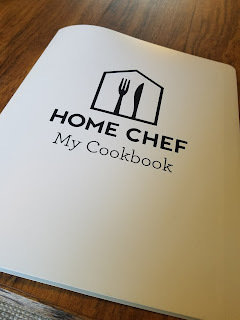 : Home Chef! After trying Hello Fresh I decided to cancel....it's great, but I can't justify spending $60 a month extra for just 3 meals. A few days later I noticed this advertisement for another meal delivery company. This one is called Home Chef. They had a deal going on where I got half off my first order. I thought why not!!! It was only $30 for 3 meals. For some reason when I signed up I could only have Friday be my delivery day. I'm not sure if that's because of my address and they are only in my area that day of the week, but I didn't like that I couldn't change it. I would have rather had them deliver it on a Monday instead. When it was delivered it was packaged just like Hello Fresh with the frozen packs to keep the food cool. One thing I didn't like was that the individual meals weren't packaged in boxes, but in bags. I know that's not a huge thing, but it did make a difference. Organizing the meals in the frig is definitely easier with boxes because they can stack and I love how I can use them as a place to put all the garbage while I'm cooking. I did use the bags for that, but since they aren't rigid like a box they don't hold as much and some of the garbage falls out. The first meal I made was the Pork Tenderloin with fig jam and roasted brussel sprouts, scallions and carrots. I have eaten brussel sprouts before, but I've never actually cooked with them. Into the over to roast! As you can see I was also warming up leftover hot dogs and chicken patties for the kids. 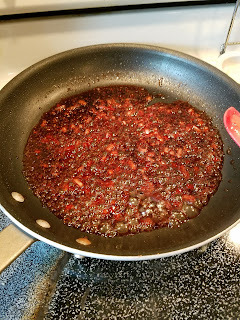 Here is the fig jam with red wine vinegar reducing! 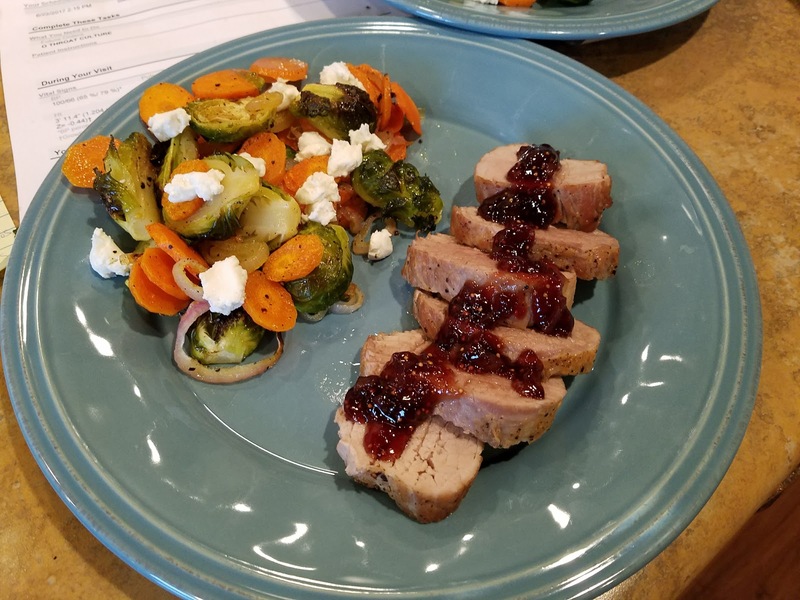 When it was time to plate everything I cut the pork and put the jam over the top and then topped the veggies with chunks of goat cheese. I just love how these recipes really show you how to pair flavors. 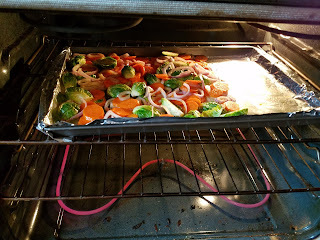 I would have never put goat cheese on veggies, but oh my goodness...YUM!!! This meal was awesome and I will most definitely make it again. Michael loved the carrots and scallions, but not the brussel sprouts. 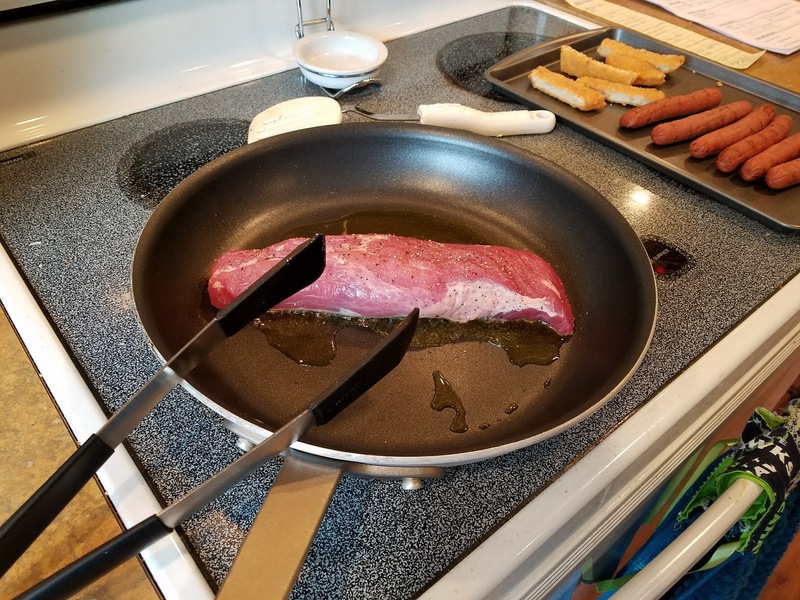 He's had them before, but he felt like they could have been cooked a little longer. Next time I'll cut them smaller so they cook faster. Everything about the meal was great to me though! Seared sirloin steak with demi glaze and twice baked potatoes was the second meal. 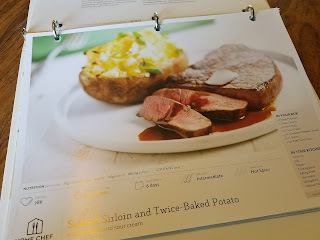 I had never made twice baked potatoes and they were super yummy, but the steak wasn't really that good. The last meal was Cedar Roasted Salmon. 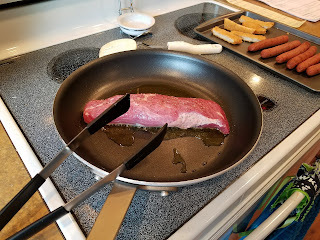 This was fun because it came with the thin sliced cedar and I had to soak them in water and then tie them around the salmon after searing it. 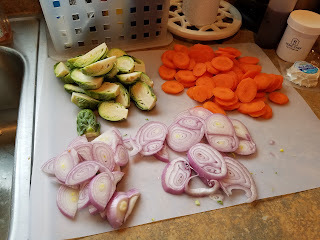 The potatoes and the red onions were great, but the green beans were already going bad so I had to throw a few of them away. Probably my favorite thing to come out of ordering from Home Chef was the binder they sent to put my recipes in. Super silly since binders are super cheap, but it's the little things that make me happy! I even took the recipes from Hello Fresh and punched holes in them so I could put them in this binder. 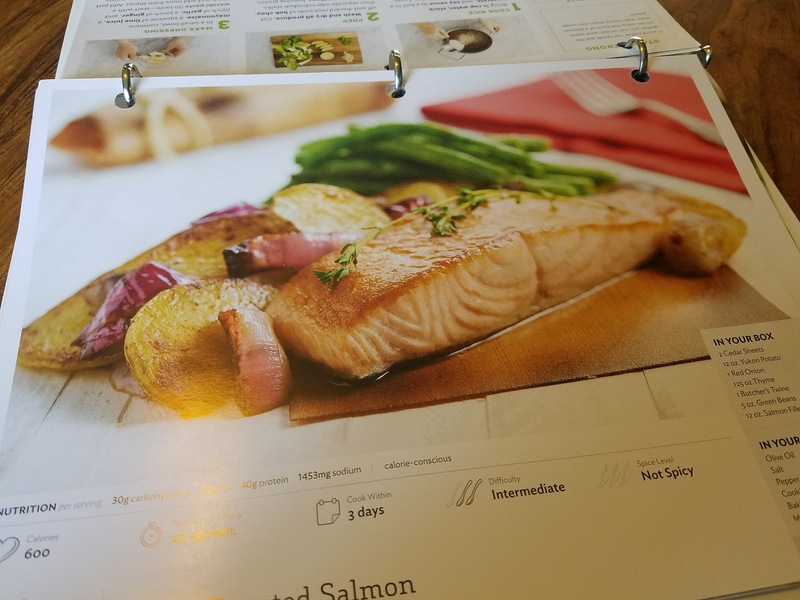 Those large recipe cards are amazing. 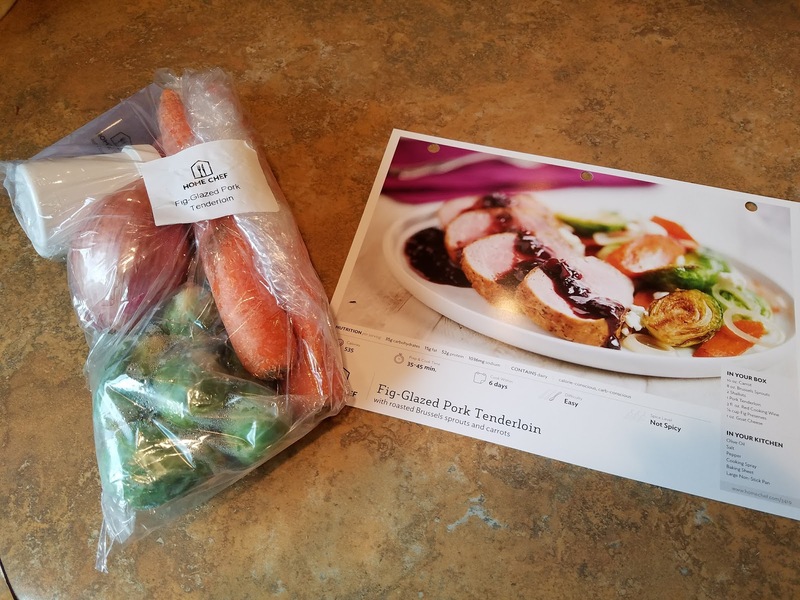 When comparing the two I would most definitely say that Hello Fresh was better than Home Chef. I just felt that all the little touches added up and then just the quality of the food was much better. I actually made the Wasabi Lime Salmon from Hello Fresh again this month....we LOVE that meal!!! 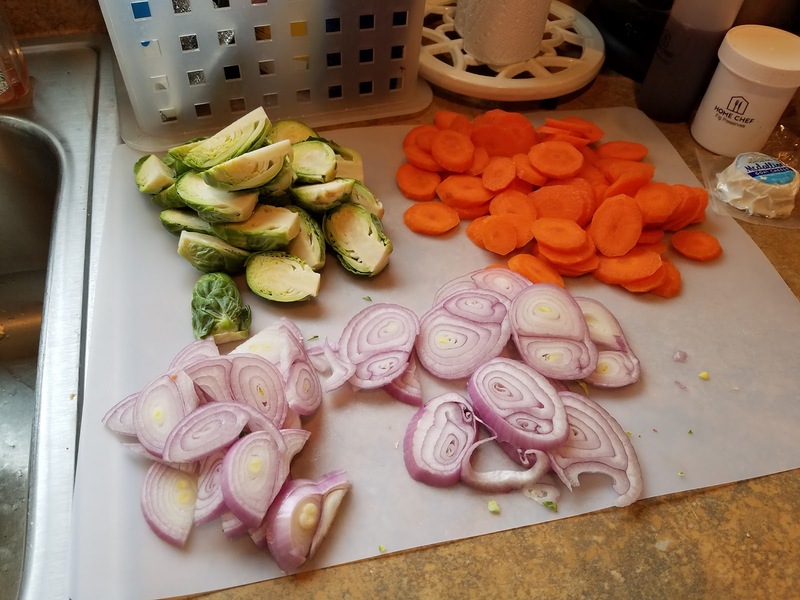 I have already canceled Home Chef and later this month we are going to receive 3 more meals from Blue Apron. They had the same deal where your first order is half off so we'll get another 3 meals for $30. I will say that Blue Aprons selection for meals was much more limited since they only work with things that are in season. It will be interesting to see if we enjoy the food or not. 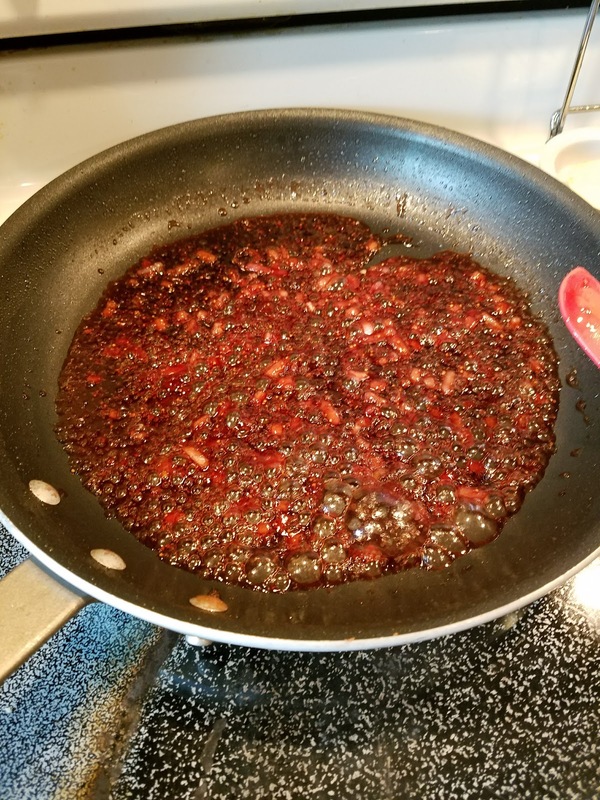 Of course I will do another blog post!